I wrote and scheduled this review a while ago. Since then another one of my children has moved out. Growing up and becoming independent are good and necessary things, but even under the most ideal circumstances they cause turmoil for us mothers. And when are circumstances ever ideal in this broken world? So I reread this review with deep sadness, but I am encouraged by it as well. May it bless and encourage you, too, wherever you are in your mothering journey. 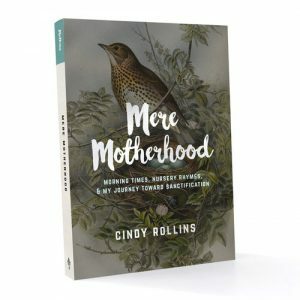 It is rare that a wise older woman lets you into her life, but in Mere Motherhood Cindy Rollins, a mother of nine who started homeschooling thirty years ago, shares essential wisdom with us. At first her writing seems very low key, with bits of humor slipped in here and there, and then suddenly there is a golden page that puts my vague thoughts into words. And then another, and another, until I am near tears. “So, you too?” I ask the book, in C.S. Lewis’s definition of friendship. 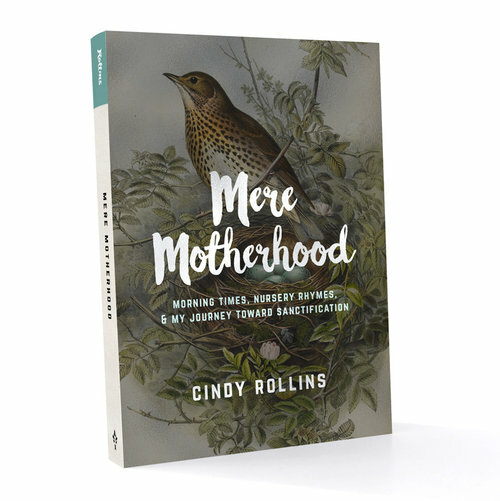 Stating unequivocally that motherhood is sanctification, Cindy shows what that means in her own life, through good times and very difficult ones—but, no, there are no awkward confessions here; we do not need to know any details, because we can fill them in from our own lives. She discusses marriage, children growing up, and helpful books. She states something my husband puts into different words: to fight the culture is to lose hearts. It is not that we cannot or should not have a Christian culture, but we should not plant our flag on issues that are not fundamental. We need to tether our children to the past so they are not adrift in the universe—their own past, our family’s past, and our culture’s past. Of course, Christianity undergirds everything, and Cindy naturally assumes that the Bible is included in this. As befits a veteran homeschooler, she talks about reading, narration, memorization, and more. Especially narration, instead of all the other things that schools spend time on. ‘What we don’t do may be the real key to success,’ she points out, explaining how powerful this simple technique is. Mere Motherhood ranges from discussions of poetry readings and sentence diagramming to Cindy’s explanation of daily nature study at her house and how one child produced a ‘daily drawing of a snake wrapped around a pole’. But how does the everyday life of a homeschooling mother lead to sanctification? In many ways, of course, but also in this, ‘learning to trust God with our children’. Finally, one last word from the very beginning of the book, where Cindy sums up her conclusions so we do not think, while reading, that her life is a fairy tale: Seek your validation in Christ; no one and nothing else will satisfy. This, in different words, is what my father tried to explain to me when I was a teen. I had not lived enough, then, to understand, but now I am beginning to see, and Mere Motherhood has helped. This is a complex book, full of ideas, wisdom, and deep humor, of opinions and faith. It is a book to read and reread, to argue with and to learn from. And then, recognizing our thoughts in Cindy’s words, we can link arms with other Christian moms and move forward, together. Mere Motherhood is important reading for all Christian mothers, and essential for homeschoolers. I highly recommend it. If you enjoyed this review, you might want to follow me on Google+ where I often mention helpful or interesting ideas, or connect with me on GoodReads where I share what I read. 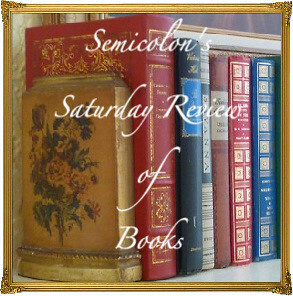 This is yet another book in the in the 2017 52 Books in 52 Weeks Challenge and may also be linked to Saturday Reviews, Booknificent Thursdays, Literacy Musings Monday, and The Book Nook, Finishing Strong ,Raising Homemakers. Disclosure: I borrowed this book from our public library. 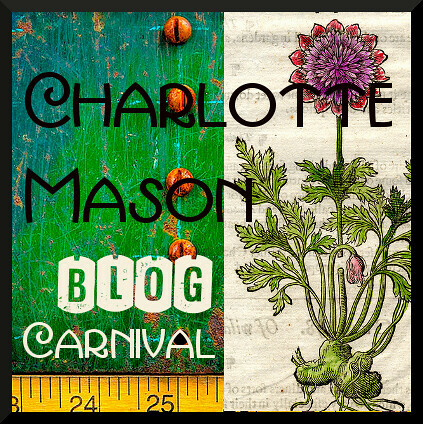 Posted in: 52 Books in 52 Weeks, Homeschool, Life, Reviews, Reviews: Nonfiction. Lovely review & yes, this children growing up business isnt easy! I’m jealous that you could find this book in your public library. Homeschooling just doesn’t have the same presence here. There are a lot of homeschooling families in our area, and that does make an enormous difference to what books are in our library. This was a hard book for me to read. It was honest and wryly funny, but it ended achingly for me. The author, now tutoring another family’s son, her own children seemingly sent to school (?) It’s so hard to stay this course and, as a mom still only half way there, it is unnerving to see such strong, earnest, gentle moms struggling to finish the race. I have used the “suggestion to purchase” many items these last 5 years in the OPL system. I am hoping to tip the balance 🙂 Blessings to you and your crew! Dear Kathleen, yes it is hard to read in many senses. But when I read it, I thought she was doing the tutoring because her own children were grown up. Perhaps I missed something, but I think not. Yes, older homeschooling moms struggle. So do non-homeschooling moms, though. And, considering what it is we are actually doing–trying to raise our children for God–it is no wonder there is a lot of opposition, from the devil, the world, our own flesh, and our children’s flesh. But never forget, God is both great and good, and he has overcome already. Thank you for suggesting so many books for the library! Someday I am going to ask you for a list; perhaps it would be worth compiling a general list so others who would be interested don’t miss these books.